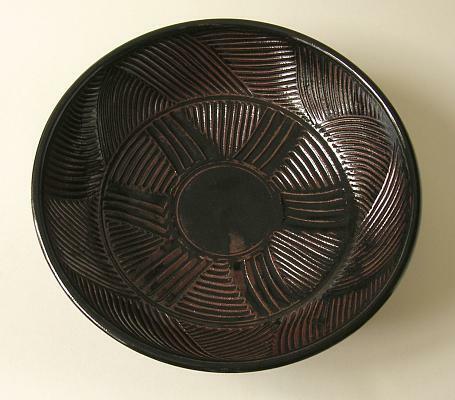 Tenmoku incised bowl marked SB or SH? I've had this hidden away for years. I love it! But I do not know who made it ... any ideas? I bought it in the West Midlands UK around 2005. Height 7cm/just under 3" by a diameter of 25cm/just under 10"
Definitely not Sue Barker or Svend Bayer(! ), and not Sam Haile or Shoji Hamada (joke!! ), ... I don't think Susan Halls or Sophie Hamilton ... unfortunately, there is a long list of SH's ... none of which seem to be the potter of this fine bowl ... of course I could be wrong about any of the above mentioned! I think the recognition will come with seeing the style of work. Sorry, I cannot get the mark to show ... but it is definitely an S ... and possibly a B or H.
So ... does anyone recognize this? 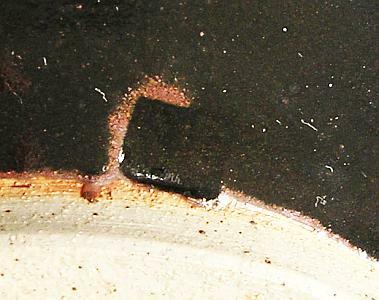 Re: Tenmoku incised bowl marked SB or SH? Do you reckon it could be Edward Hughes? ... Surely not Derek Clarkson!? Frustratingly I came across a similar bowl when searching for someone else and thought it was an unusual design for the potter. I just wish I’d taken a screen shot of it for reference. Helps to have a photo of the base. 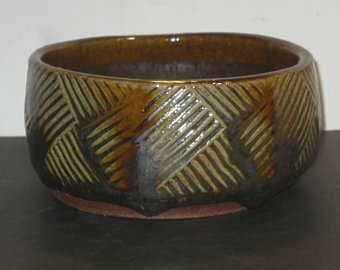 From the style a potter that comes to mind is Helen Pincombe. Not so well known now, but I have seen a number of her bowls of hers with similar decoration. Thanks for that philpot. I can see why you think this could be one of Helen Pincombe. 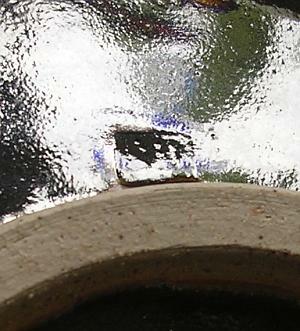 I have taken another shot of the base and tried to be able to better view the mark ... which looks very like SH. So, what do you think? 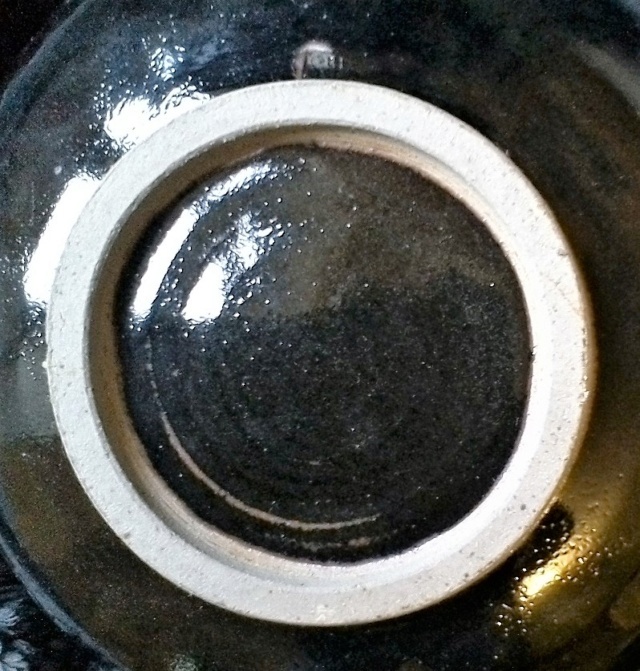 With glaze flooded marks it is always fiendishly difficult to interpret them. You go on endless speculation. Helen Pincombe's mark is a small HP, which is often difficult to interpret. Although from that photo I doubt it is hers. In fact, looking at that S it reminds of the standard St Ives mark!. It is a highly skilled piece. Even more so because because of that incised decoration, which few potters have the skill to do, There is really no highly skilled potter I can think of doing this sort of Anglo/Japanese work with the letters SH. Although, having said that. Both Ursula Mommens and Chris Lewis worked at the South Heighton pottery near Newhaven Sussex. They did use an SH mark which was an S incised within an H, as well as their personal mark. This sort of style is exactly the sort of thing they have done, and they are both exceptional potters. Is this what is called paddled work? This thread is the perfect illustration of the frustration of an filled glaze mark. Michael really spells it the same way but I think he gave up telling people. I have visited Michael a number of times and have seen many of his pots but nothing with this type of decoration. That doesn't mean he didn't make it though. Thanks for that studio-pots - for some reason I cannot use facebook so I have contacted them via a website. I too have my doubts about this bowl being one of theirs. The mark is almost definitely an S plus possibly an H ... but the style does not match any potters who use SH ... still, I'll keep looking ... and perhaps if Michael or Anthony respond they might direct me to someone else ... here's hoping!